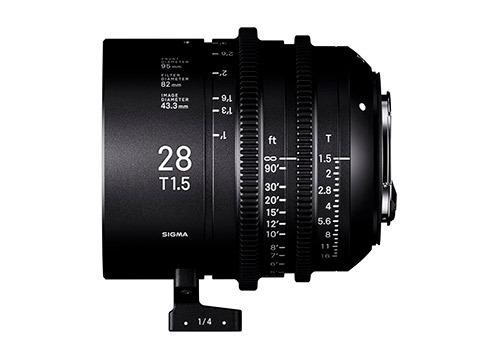 Ronkonkoma, NY—Sigma Corporation of America announced one of the newest additions to its cine prime lens lineup, the Sigma Cine 28mm T1.5 FF, is now shipping. The 28mm T1.5 FF is a fast, sharp T1.5 cine lens compatible with full-frame camera sensors. 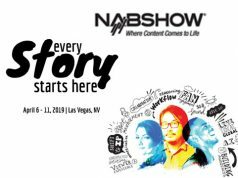 Moreover, it is optimized for ultrahigh-resolution 6K to 8K productions. 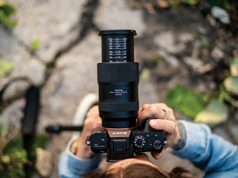 Featuring a 180º focus rotation, the lens is available in EF, E and PL mounts with a lens support foot and cap included. One of the key focal lengths to achieve a true cinematic look, the wide-angle perspective of a 28mm lens is an industry standard in shooting motion pictures. 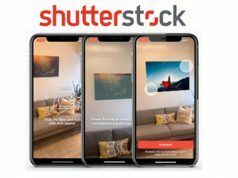 “DPs and filmmakers of all genres will now have the opportunity to add this gem to their Sigma Cine lens collection to further enable their creative vision and enhance their workflow,” the company announced. In addition, Sigma is offering a five-piece hard case that holds the 14mm, 28mm, 40mm, 105mm and 135mm cine lenses. 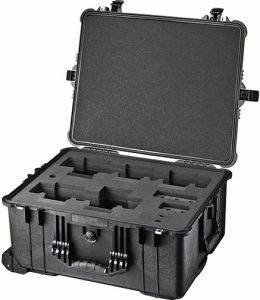 The new case retails for $750. Sigma Cine lens undergo individual inspection. Sigma employs its A1 proprietary Modulation Transfer Function (MTF) measuring system using 46 megapixel Foveon direct image sensors. As a result, previously undetectable high-frequency details are now within the scope of their quality control inspections. Moreover, Sigma used computer-based ray tracing from the design stage onward, to minimize flare and ghosting and enhance contrast in backlit conditions. Ghosting is also checked and eliminated at every prototype stage. In addition, for easier color correction, color balance is standardized across the cine line. Other shared features include: dust- and splashproof construction; 100% metal bodies; luminous paint for enhanced visibility; and laser engraving for enhanced durability. In addition, Sigma’s Mount Conversion Service permits users to convert their lenses to and from EF and E mounts (charges apply). The Sigma 28mm T1.5 cine lens sells for $3,499 for the regular version. The fully luminous (FL) version retails for $4,499.